The portals between our worlds are open, we now mingle amongst you all and we fully blend in your appearances. We have chosen to assist you all in this planetary shift as we are here for Gaia and her growth into the deepened levels of Light. Our love for this planet, Her Being and nature is our devotion and service. You will all have a different way of perceiving us and of addressing our energy for we are seen in many ways and forms. Coming from the heart of Gaia, residing in her inner Being, we are Stellar consciousness now as we have risen our frequencies, like you all, together with Gaia. 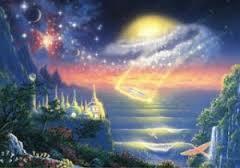 We now are coming out of this inner resort which is our light world, to incarnate or take on forms that are a part of your outer reality. You shall see and recognize most of us as part of the nature kingdoms; others are chosen to serve in human forms. Those of us in human forms are passionate gardeners, conscious of Earth being a living Being, sharing a great Love for the environment and nature, having respect for all living beings, in love with everything that makes up this planet as beautiful as she is, devoted to cleanse this world and make a difference, sensitive to Earth changes, and a warrior when it comes to defend the beauty of this planet. We are the keepers of her beautiful kingdoms in a sense as soon as we come up to the surface. For a long time we preferred hiding in our light cities as we awaited the frequencies to rise up to a higher level. Now we are needed and wanting to join you all in this occasion to elevate the consciousness of this entire planet. We serve Gaia with you and we are in Love with all that she represents. Your world is merging with ours and so beauty will prevail and all that needs to be restored shall be restored in the process. We bring 4 light torches with us that will be handed over to the elementals which are the keepers of your climate, your weather and the make up of this beautiful world. These light torches consist of new information for the planet and all of her consciousness on it to further unfold the regeneration process in order to restore her pristine beauty. Each light torch has encodements and light language information that are planted as seeds within the human consciousness as well as within Gaia's Soul, as you raise your vibration together. Each Light torch is being placed at their point of connection related to your four cardinal directions. One at the north pole, one at the south pole, one in the East and one in the West at their center point of your planet. Moreover we are interconnecting with the spirits of the Devas, the Fairies and the elementals to ensure that these light torches with information are being implemented as they should. Your Earth's beauty shall arise again and become pristine as once before, this is our intention and devotion to fulfill this together with you. It is therefore that the human consciousness is receiving those encodements as well so that the awareness of this planet's Being can birth within those who have no sense of this yet. Those of you who have already this awareness may even begin to feel called by nature and Gaia's kingdoms, to participate more consciously and to assist where you can. Gaze upon your environment and nature and give it your love and attention. This way you nurture Gaia's Heart as she will feel even more loved and appreciated. Colors shall come through at a rate you could not perceive before as you stare into the consciousness of a conscious living Being. You will be welcomed by and absorbed into Her beauty and you will exist in a moment of timelessness. These super frequencies are arising on your Planet now and they will take you into journeys not experienced before. And we now join you on this ride with pleasure and delight while we nurture your hearts and Gaia with our great love for all life. We help you to understand nature and to see her beauty within yourself and through your own eyes. We are with you now and we will come increasingly more and show you what we are all about. The inter dimensional journeys from your world and your realities to ours are open and available. Join us in this moment so that we can celebrate the beauty of this planet to return to the way she once was. The connection lies here and it is open, you only need to make the step by intention and feed yourself with our essence of deep love and care for this planet. Our technologies are based on this love and care frequencies as we work with the resources of Gaia's Presence. The natural elementals. Find us within your own hearts and you will come to find us in others too. We appear and do our work in serenity and silence, yet we are strongly present and available as well. You will know who we are as you gaze into our eyes and see the world reflected into our Being. See us in you as we see you in us. Blessings from the Keepers of Gaia from Telos inner Earth.